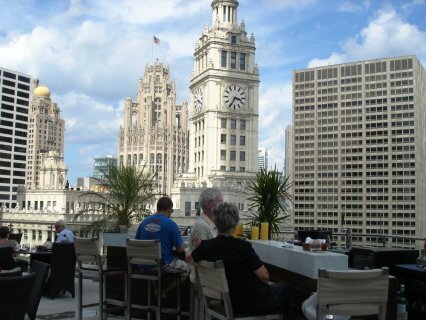 The terrace on the 16th floor of Trump Tower in Chicago is pricey, but the view is worth a million dollars, so the prices didn’t really seem too high. After visiting on a sunny Wednesday afternoon in late September, one of the last days for sandals and al fresco drinks, the $30 hole in my pocket for two specialty drinks didn’t seem quite so bad. What stayed with me was the view, facing east along the Chicago River, nearby skyscapers up close and personal, the city at our feet. Fabulous. I had the Snapdragon to drink, a mixture of vodka, mashed strawberries and various other ingredients. It was refreshing, kind of like a flavored martini but not quite so sweet. In fact, I liked it enough to get another. But perhaps it was just the setting that encouraged my order. Especially with summer about to move to the rear-view mirror, a fruity drink on a sunny if somewhat windy rooftop with views of the river, Lake Michigan and Chicago skyscrapers seemed worth the price.